Recently, at NYC Couture Bridal fashion week, as gorgeous wedding gowns floated down the runways, all we could think about was bridal accessories. 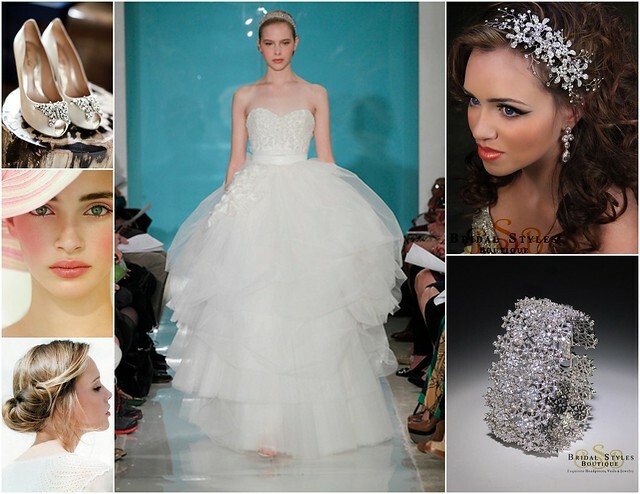 After all, though wedding dresses are stunning, veils, sparkly hair combs, bracelets, and earrings amplify the fabulous! In every show, there was an emphasis on timeless romance, a trend which every bride can make her own. If a classic silhouette is more your style, the layers of lace and tulle of this Reem Acra gown could be a great fit. 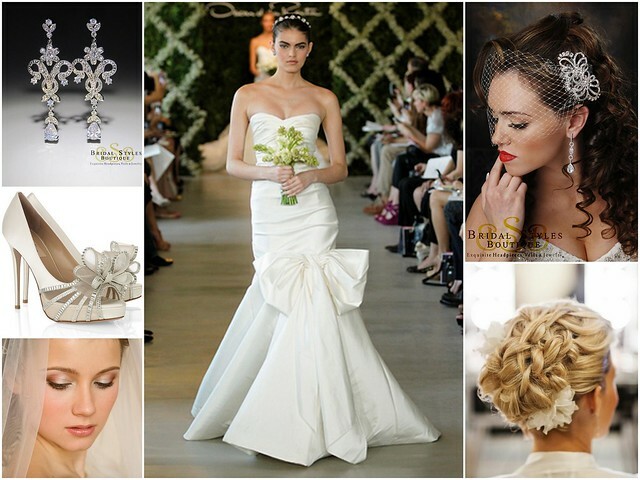 Slip on a delicate statement bracelet and spectacular crystal flower hair comb to echo the gown’s sweet details. Choose a hairstyle that’s loose and dreamy to go with your pale pink make-up, and voila! A bridal look that’s got oomph and classic, romantic style! For those of you drawn to something a little more sleek, this Oscar de la Renta number will have you weak in the knees! Its wonderful bow detail is enhanced when paired with fantastic chandelier earrings and divine Valentino shoes made of dazzling ribbon. Adorn your up-do with hair combs (complete with bows), and you’ll wow as you walk down the aisle. To find just the right bridal accents for your classic, romantic wedding day look, visit us at our New York bridal accessory boutique! This entry was posted on Friday, April 27th, 2012 at 12:31 pm	and is filed under Blog, Inspiration. You can follow any responses to this entry through the RSS 2.0 feed. You can skip to the end and leave a response. Pinging is currently not allowed.